Meet Eeyore! This moment was one of my most memorable since I began travelling the globe. Australia is one of my favourite countries to visit because it reminds me a lot of home! Brisbane was another one of my ‘bucket list destinations’, so I was thrilled when I was able to swap onto this flight. We ended up landing pretty late at night, but it worked out because several of us wanted to visit the Lone Pine Koala Sanctuary in the morning. Following a good nights sleep, we met for breakfast before hopping into an uber to make our way there (which was way more affordable than a taxi cab). I’m always hesitant to support any sort of organization that keeps animals in captivity and uses them for any sort of entertainment, but after doing my research on Lone Pine, it is clear that the animals are taken care of and are kept in spacious, well-maintained enclosures. The sanctuary is also the world’s first and largest koala sanctuary with over 130 koalas, and is purely dedicated to the conservation and well-being of all native Australian animals. I found great comfort in that! 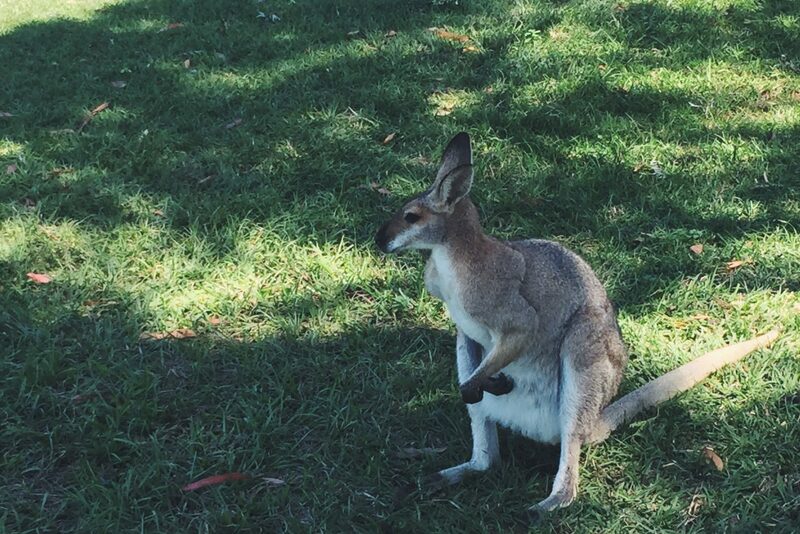 A timid kangaroo at the Lone Pine Koala Sanctuary. 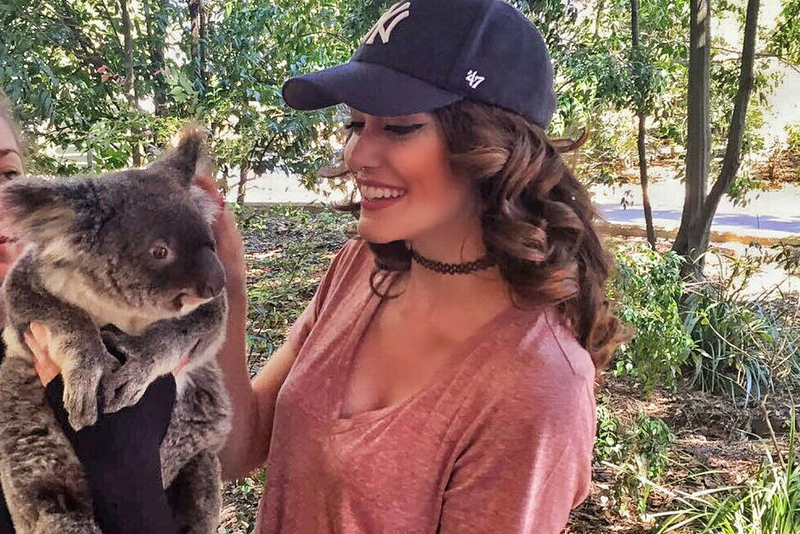 At the sanctuary, you are given the opportunity to hold a koala anytime and feed the kangaroos by hand. Although the koalas are given a break every 30 minutes and are handled by trained professionals, it still made me uncomfortable to do either. Holding them can stress them out, and feeding an animal by hand made me feel uncomfortable because I didn’t want to interfere with their diet. I did however snap a few pictures interacting with them, as they seemed to be in both good health and good spirits. This made me feel better about supporting the sanctuary. We ended up missing the ferry we wanted to take from Lone Pine to downtown Brisbane. To get back to our hotel, we ended up taking another uber. We finished around 2pm and decided to walk around downtown and explore the city afterwards. 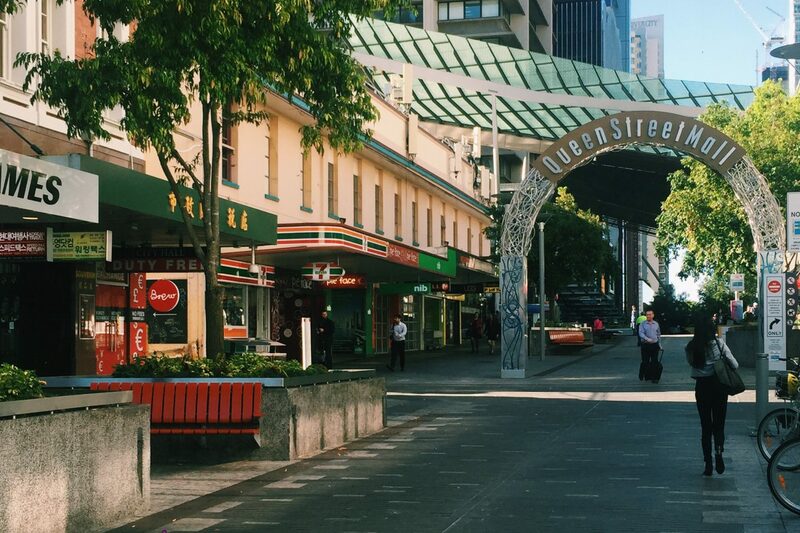 Our last stop of the day was Queen Street Mall- a pedestrian mall containing over 700 retailers. After a few stops there, we returned to our hotel to rest before our 2am wakeup call. Overall, I loved visiting Brisbane, Australia and would love to operate the flight again! If you go: The ferry from downtown to Brisbane only operates a few times each day. Make sure you plan ahead if you want to catch it! Also be aware of the day in which you are visiting Lone Pine Koala Sanctuary. It get’s really busy on the weekend because it is a very popular tourist destination.